In this post, you will learn which laws you need to consider as a drone pilot in our neighboring country. In France, there are regular changes to the drone laws. Drones with a take-off weight of 800 grams or more must now also be registered by private users via the AlphaTango portal. For all other areas, the maximum altitude of 150 meters applies. Maximum horizontal distance and FPV: Drones may only be used within sight. For FPV flights, a second person must be present to monitor the drone with the naked eye. 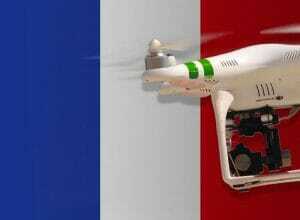 Compulsory insurance: In France, the completion of drone insurance is mandatory. Maximum take-off weight (MTOW): Private multicopters may weigh up to 25 kilograms. Distance to airports: You must always maintain a sufficient safety distance to airports. To large airports is a minimum distance of 10 kilometers. Other safety distances: People flying over are not allowed in France. No Fly Zones: A ban on drones is valid throughout the city of Paris. Even in other cities, you can only fly your drone on private property. Also, drones should not be used near nuclear power plants, military facilities, historical monuments and national parks. You can see the no-fly zones in the map linked below. Operating hours: You are allowed to use your drone in France only in daylight. Even with appropriate lighting, the use at night is not allowed. Special regulations: Fully automatic flights (e.g., waypoints, points of interest) are permitted within a radius of 200 meters of the pilot, if the maximum altitude is 50 meters, you can regain control at any time, and the drone weighs no more than 2 kilograms. Requirements for commercial pilots: Commercial Copter pilots must meet several requirements in France. Among other things, you have to pass a theory and practical tests in French and obtain various permits. Good to know: The rules listed here also apply to the overseas territory of French Polynesia. Violations of French law can result in a fine of up to € 75,000 or imprisonment of up to one year. We have researched the listed drone regulations for France to the best of our knowledge. We can not guarantee the correctness of the information. If you want to be on the safe side, please contact the competent aviation authority. Alternatively, you can also ask the embassy in your country for further information about the regulations. Please leave us a comment when you receive news and/or gain experience with your copter in France! Well, your understanding of French rules is not really clear. Many rules come both for private/leisure or pro/commercial flights. What about drones below 200mg weight? Below .. 200 grs ? No declaration, no quizz, but same rules, forbidden in any public city area and all restricted/dangerous/prohibited areas also. I’m looking to commercially film holiday homes in Frances. As far as I understand, France doesn’t make a difference between recreational and commercial flights if within S1 limits, aka the safest and simplest flights. Would you have an indication to think differently? I am planning to fly a drone here in France but I noticed there are just very few interesting places allowed to fly. Do you know if there is a chance to ask a permission to fly for example in city area, and if so where I should apply such? Thank for your answers in advance. Zero chance to fly in a city area NOR a crowded area. By end of year traveling from Barcelona, Spain to Nice, France. Any suggestions for some drone filming and pictures in cote d’azurr? I was thinking near Cap Camarat or Etang de Leucate area. Also when crossing border from Spain to France in Le Perthus, to take some images of the Fort Bellegarde. Or any better suggestions. Not very crowded so to not have complains from people about privacy or which don´t like drones. I can fly also in Ccap d’antibes with maximum altitude of 50 meters? It’s supposed to give restrictions and free areas to fly. Etang de Leucate : take care, restricted area R73 and ULM base south of the lake. Main part of Cote d’Azur is forbidden , restricted/forbidden, civilian or military areas, airport protections and crowdy areas, avoid. Really thanks for the information. Much appreciated.